A few simple pointers can set you on track for how to make a business card. When designing a business card, it’s best to start with the most important pieces of information. Combing things like size, contact information, and your brand all into one little space can be overwhelming. Business card marketing plays an important role in any business though, so here’s a quick checklist to get you started. There is more than one way to make a business card. The standard business card is 3.5 x 2 inches. This is the perfect size for business card holders, binders, and wallets, but you can also dare to be different. A 2 x 2” square can make your card stand out from the rest and still fit into a standard case. If that’s still not exciting enough for you, consider using a custom die to give your card a personality that is as fun as you. If you’re a dog trainer, try a bone-shaped card. That’s sure to grab your potential client’s attention. PrintPlace.com currently offers many custom shapes and we can even create a new shape just for you. Your business card is a direct reflection of your business. 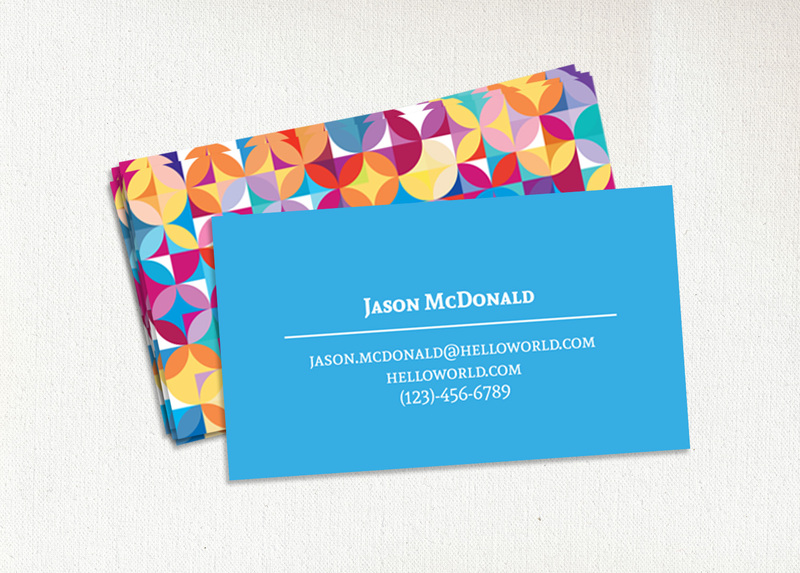 If you have company colors or a specific font you use, make sure to carry them over to your business card. There are so many differing opinions on whether to keep your design simple with muted colors or go bold with bright colors, so choose what is best for your card. You’ll want it to stand out amongst others so make sure it is a color palette that represents you and your company. A photographer might put a full bleed photograph on one side to showcase their work. Lawyers or realtors might keep it simple with a headshot and contact information. An event planner might even go with something fun and bright with colors that really pop! Whichever option you go with, the most important design element on your card should be your company logo. Keeping your logo as a main focus is important because that’s what you want people to notice. Your business card is supposed to accent your logo, not overwhelm it. Most printing companies require a full bleed and include a caution area. Always keep important information or images at least 1/8” from the trim line. This insures that nothing will be cut off. Your design should also bleed off the entire piece for a nice crisp look. Before finalizing your business card, go through your personal stash of cards from other professionals. Look at them carefully to see what features turn you off. Are the fonts too hard to read? Is the logo too small? Do the colors clash and hurt your eyes? Make a list of all the things you like and dislike about these cards and then put your own card to the test. Sometimes a fresh pair of eyes can help too. Always ask for other opinions before having your cards printed. Once you’re satisfied with your finished piece, upload the design to PrintPlace.com and let the printing process begin! Once you have the business card basics down, give some cards of your own a try.